I’ve been asked by a few people to take them step by step through my eyeliner technique. I do try and show this on my video tutorials but will admit that I often skip over it so as to get to the fun part which is the colour! However, this is a very important part of all my looks so I think it’s a good idea to go through it, step by step. Firstly, I use a cake liner, this works better than a gel liner and especially safer than kohl. This is a Kryolan cake liner, the very best that I have found. It doesn’t smudge, flake or run and it’s a true black. It’s also available in other shades such as brown and navy which are worth getting for a softer look. 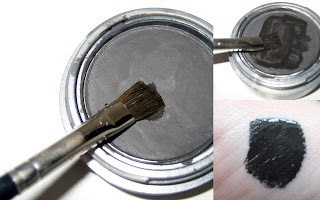 The brush needs to be synthetic, tightly packed and totally flat. No slants, no domes and definitely NO points. The cake liner needs to be mixed with a small amount of water to create a paste. Think of the texture as being similar to runny mascara. Let’s start by going through application of Step 1. This takes a steady hand so it might be worth sitting down and resting your elbow to create a pivot. 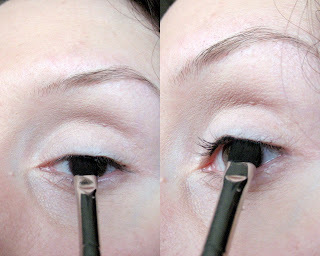 You can use your free hand to lift the lid slightly, or, as shown just place the brush under the lashes and press and wiggle right into the roots. Start in the centre and work outwards, then from the centre inwards. The end result should look like the 3rd picture along. Ideally there won’t be any liner on the inner rim. If there is, simply take a cotton bud, dampen and gently run along to remove. I take the liner from lash end to lash end. Going right into the inner corner is much more dramatic, so probably best saved for evening. 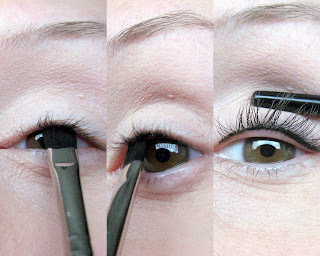 Step 2 is similar to Step 1, although the brush now sits on top of the lashes. This is not to create a liquid liner effect. This should be placed in the same point as before, in-between the lashes. As you can see, the lashes are pulled down and the end of the brush is hitting the same spot as from underneath. This helps to darken the roots of blonde eyelashes, as often mascara won’t reach this part. The end result of this is a clean, defined look. If mascara is put on, this line disappears and all that is left is the impression of fuller, thicker lashes. Nice! This eyeliner trick can be worn alone, or with a soft shadow for a natural look. I’m going to take you through how to create a smoky eyeliner look using just a kohl pencil and one brush. Above are 3 brushes, from left to right: Shu Uemura Kolinsky Brush 10F, Laura Mercier Corner Eye Brush and Laura Mercier Smoky Liner Brush. These would all be suitable to use for this step but would give different finishes. The longer and larger the brush head, the more smudged the liner would be. I wanted a reasonably small smudge so I used the Smoky Liner Brush. I used my favourite Kohl pencil. Prestige Total Intensity Pencil. I urge you to give this a try. It’s under £5 from Boots! I’m just doing a line along the top in this demonstration. Note how I have the pencil on its side. This is the easiest way to run the pencil along the lashes as you can almost use the lashes to rest the brush on. The issue of wiggling the pencil in-between the lashes to darken the roots is no more as the cake eyeliner is already there, creating a base for your kohl. I start in the centre, above the iris and work outwards, coming to the inner corner at the end. I wanted to open my eye up with this technique so I have lifted the liner in the centre as opposed to creating the width at the outer corner. To smudge I take the brush and run gently along the edge of the line, pulling upwards as I go as I’m not looking to pull the line outwards. Note how I’m holding the brush at the same angle as the pencil. I’m using the long edge of the brush as opposed to the fine point. The end result should look soft, blended and subtle. Below is the end result, sans Mascara. For an evening transformation, I’d simply take the pencil, dot very subtly under bottom lashes and use the Shu Uemura 10F brush to work right into the lashes. To intensify further, I’d line the inner rim too. I hope this has been helpful and interesting! Don’t forget you can see more of Katy’s beautiful and helpful tutorials on her blog at http://makeupbykaty.blogspot.com/ Thank you so much for creating this masterclass for us, Katy! I hope my readers find it useful. This is perfect! I think my eyeliner application is ok but I've ALWAYS wanted to know how to smudge it properly as when I do, it goes all over the place. This was so informative! I like that she pushes the liner into her top lash base, opposed to just tightlining like I do. I'll have to try that technique instead.